Battle Pack: Epic Dawn is the first set in the TCG exclusive Battle Pack series, specifically designed for sealed play. It is followed by Battle Pack 2: War of the Giants. 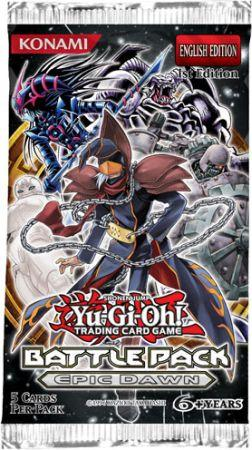 Cards numbered 1 to 55 are Rare cards that encompass the most powerful cards in the set as well as all Xyz Monsters. Cards numbered 56 to 110 are Common cards, mostly Spell/Trap cards, and mostly with the ability to remove cards from the field either directly or indirectly (such as by changing the outcome of a battle). Cards numbered 111 to 170 are Common cards and are always high-ATK monsters. Cards numbered 171 to 220 are Common cards and are always lower-ATK monsters with useful effects. "Gem-Knight Pearl" and "Backup Warrior" were made TCG-legal with the advent of this set, having been OCG exclusive cards before. All Rare cards in the set have a glossy white or glossy black card title, similar to Duelist League Rare cards, rather than the usual silver holofoil. This set also introduces a new rarity, Starfoil Rare. "Dark Mimic LV3" was originally planned to be included in the set, but was ultimately replaced with "Gravitic Orb". "Chaos Command Magician" was also considered to be included, but was removed to reduce the number of high-Level monsters in the set. Yu-Gi-Oh! Trading Card Game Battle Pack: Epic Dawn. Introduction of the GIANT CARDS! ↑ Jerome McHale (17 September 2012). "4 Cool 'Caster Combos!". Konami. Retrieved 30 July 2016. ["Chaos Command Magician"] was also under consideration for Battle Pack: Epic Dawn through the final stages of development, but was eventually cut when we realized we had too many high-Level monsters.